Potrebbe essere più breve del previsto, e risolversi forse entro la fine dell'anno, l'attesa per il nuovo capitolo della collaborazione tra Louis Philippe e Stuart Moxham, The Devil Laughs: "The album has now been completed - all done, bar the final mastering. Those familiar with the previous collaboration between the two musicians, The Huddle House, will think they have an inkling of what's to come - in which they are not necessarily right. Louis's role in The Huddle House was primarily that of a 'super-sidekick', providing vocals, guitar, vocal arrangements (plus a bit of bass and keyboards), but clearly deferring to Stuart when it came to define the album's ultimate shape. Not on this occasion. 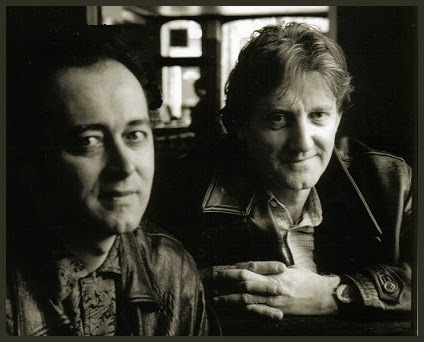 If all the songs, bar one (whose music was written by co-producer Ken Brake), have come from Stuart's pen to start with, their development and realization were the product of an equal partnership, Louis sharing lead vocals duties on several of the dozen new tunes which compose this album and taking care of most of the arrangements, as well as playing a number of instruments. Danny Manners - in his double bass-playing guise - is also a key member of the team behind The Devil Laughs, part of which was premiered at a one-off show at the Lexington on 30 October last year."